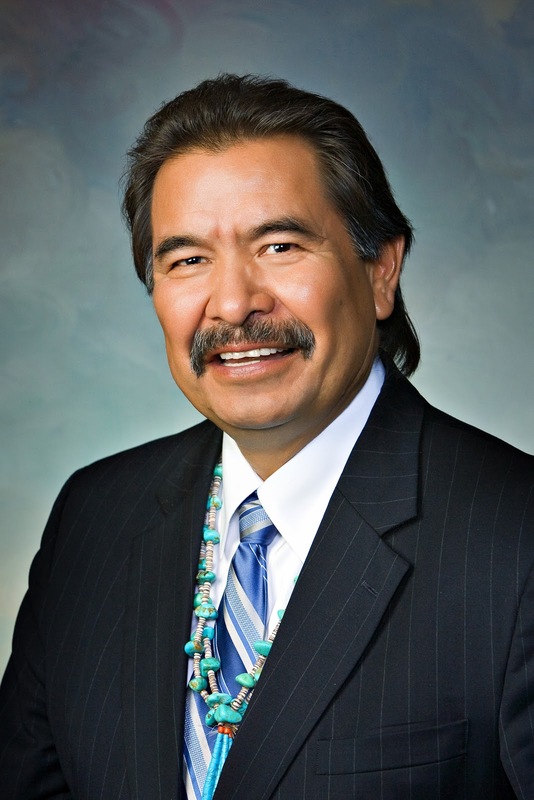 STATE CAPITOL, PHOENIX – Recently the Arizona Native American Caucus reviewed the complexities of the Northern Arizona Water Rights Settlement to gain a better understanding of water issues facing the state and Indian nations. Rep. Jamescita Peshlakai, D-Cameron (District 7), said she is pleased that the Arizona Legislature is taking an interest in the water rights settlement. “Water is a precious resource,” she said. “Educating the Legislature about the history of water rights and water use in our state is of the utmost importance." George Mase, council representative, chair of the Water and Energy Task Team, Hopi Tribal Council. The Native American Caucus meets regularly during the legislative session to discuss topics of importance to Native American communities but this was the final scheduled meeting for 2013. Rep. Victoria Steele, D-Tucson (District 9), said the level of participation and interest in the caucus impressed her. “It is a sign of respect that our fellow legislators and the staff have continually attended the Native American Caucus meetings to learn more about issues affecting Native American people in Arizona,” she said. Copies of the presentation materials are attached. More specific information about what was discussed at the caucus meeting on April 25, including presentations and other documents, is available upon request. STATE CAPITOL, PHOENIX – Today marks the 100th day of the legislative session and Arizona House Minority Leader Chad Campbell, D-Phoenix (District 24), wants the Legislature to intensify efforts to pass a state budget and vote on Medicaid expansion. “Today is the 100th day of the legislative session and we are no closer to passing a state budget now than we were on the first day. The state constitution requires the Legislature to do one thing – pass a budget. Unfortunately, partisan politics and ideology are pulling our state’s priorities off track. The people of Arizona deserve more from their elected officials. “House Democrats spent this session working on legislation that would create jobs, improve education and expand access to health care. In February, we proposed a budget that invests in mental health care, promotes school safety and eliminates wasteful spending by closing corporate tax loopholes. There is a lot of common ground between our proposal and the governor’s budget proposal. It provides an opportunity for us to set aside partisanship and work together to move Arizona forward. “That opportunity has been wasted. Instead, some of the ideologues decided to spend their time fighting with the governor over Medicaid expansion. Expanding Medicaid would bring federal resources into the state. It would give hundreds of thousands of Arizonans access to health care and would create thousands of jobs. We need to pass Medicaid expansion sooner, not later. A copy of the House Democratic Budget can be found at http://www.azhousedemocrats.com/2013/02/house-democrats-release-budget-today.html. 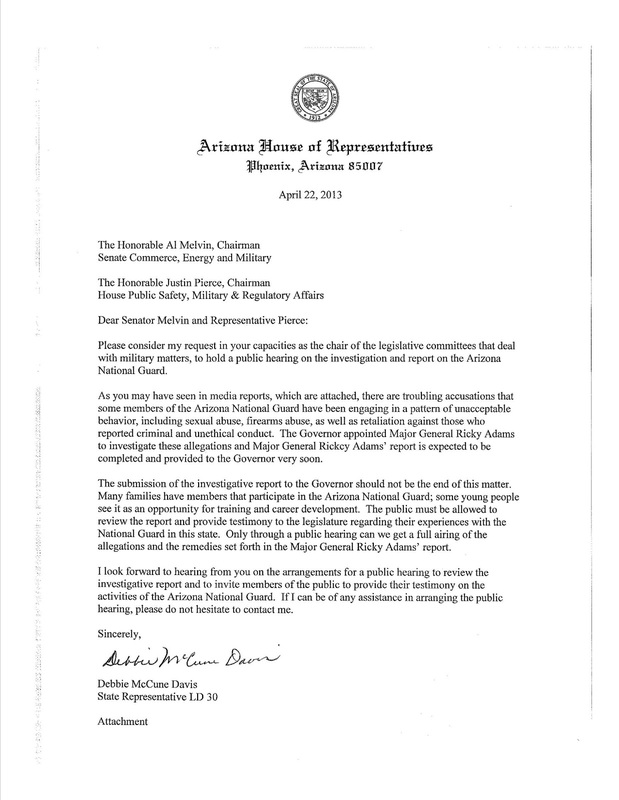 STATE CAPITOL, PHOENIX – Rep. Debbie McCune Davis, D-Phoenix (District 30), is calling for a public hearing to review the results of an outside investigation into the mounting accusations of misconduct in the Arizona National Guard. 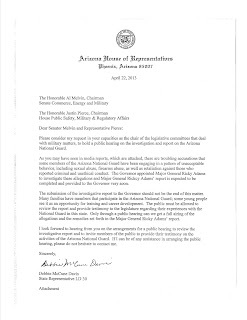 Today, McCune Davis asked Sen. Al Melvin, R-Tucson (District 11), chairman of the Senate Commerce, Energy and Military Committee and Rep. Justin Pierce, R-Mesa (District 25), chairman of the House Public Safety, Military and Regulatory Affairs Committee, to conduct a public hearing on a report from Major General Ricky Adams regarding the Arizona National Guard. McCune Davis said the report should not be tucked away from the public. McCune Davis also offered to help Melvin and Pierce organize a public hearing. "We want to see our community be able to move forward. We want the country to be able to move forward and we know with comprehensive immigration reform that is possible." STATE CAPITOL, PHOENIX – House Minority Leader Chad Campbell, D-Phoenix (District 24), released the following statement regarding the congressional immigration reform bill recently introduced by a group of U.S. senators. “The legislation put forth by the U.S. senators is a reasonable and fair place to start the debate about immigration reform. It is my hope that the Senate will take quick action on this bill. “While there are some portions of the 844-page bill that I am concerned about, there are sections that provide common-sense reforms. The bill outlines a reasonable pathway to earned citizenship so hard working people across this country can pursue the American dream. That component is an absolute necessity for any legitimate comprehensive immigration reform plan. It also improves the security of our border and accountability for those employers who are breaking the law. “The U.S. Senate vote is a slap in the face to every parent whose child was lost in the Sandy Hook shootings as well as the countless other gun deaths that have needlessly occurred in this country. The bill defeated in the Senate today would have only expanded the background check requirements on gun show and internet sales. “It was a weak compromise in my opinion. We also need background checks on private purchases, as I have proposed here in Arizona. The fact that members of the U.S. Senate refuse to even pass this modest reform is just unconscionable. Law-abiding gun owners have nothing to fear from a background check. Background checks are intended to ensure the safety of the public by keeping guns out of the hands of criminals and people struggling with mental instability. Campbell, a gun owner and supporter of the Second Amendment, introduced a package of reforms in the Arizona House of Representatives earlier this year to address school safety and to promote common-sense gun reforms. None of the bills he introduced were given a hearing by the Republican-controlled Legislature. Provides funding for the School Safety Program and more on-campus School Resource Officers, requires schools to conduct and update regularly a comprehensive threat assessment with the technical assistance of the Arizona Department of Education’s School Safety and Prevention Unit, provides funding for enhanced school security measures and doubles the number of school counselors to provide more mental health professionals in the school to help identify children who may need services and intervention. Provides funding for services to seriously mentally ill individuals who do not qualify for other health care programs. Representative Campbell also supports full expansion of Medicaid coverage to individuals with an income up to 133 percent of the federal poverty level to ensure expanded access to mental health services. Reforms the mental health care system to incorporate incentives for providers to produce positive outcomes for the clients they serve. Requires law enforcement coming into contact with an armed person who appears to be a threat to him/herself or others to temporarily seize the firearm and initiate a court hearing process to determine whether that person should be allowed to own a firearm. Establishes a court hearing process for voluntarily committed persons to determine whether they should be allowed to own firearms. Ensures that local government agencies can adopt ordinances to allow for the disposal of guns they obtain through seizure, forfeiture or abandonment, including through firearm “buy back” programs. Prohibits persons from owning a firearm if they have an order of protection issued against them which has been issued after a full judicial proceeding where both parties were present. Reinstates the training and other requirements that were in place previous to 2010 related to receiving a permit to carry a concealed firearm. Closes the gun show loophole by requiring sales and transfers to take place through a federally licensed firearms dealer to ensure all background checks and other requirements are met and requires that person-to-person sales, loans and transfers of any firearms defined as “assault weapons” be processed by a licensed dealer to ensure all background checks and other requirements are met. STATE CAPITOL, PHOENIX – Chairman of the Arizona Latino Caucus Rep. Martin Quezada, D- Phoenix (District 29), released the following statement regarding the comprehensive immigration reform legislation recently proposed by a group of U.S. senators. “I am pleased a bipartisan group of U.S. senators is taking the lead on comprehensive immigration reform at the federal level. It is an emotional and complex issue that affects every state, especially Arizona. It is good that we finally have a starting point for this important debate. “Although some of the provisions are troubling, I support efforts to create common-sense reforms. No immigration reform proposal would have been acceptable if it had failed to include a reasonable pathway to citizenship. We must find a way to provide fair citizenship opportunities for students, immigrant workers and their families. The bill affirms that an estimated 11 million immigrants would be given the chance to legalize their status with a new visa that will create a registered provisional immigrant status. Capitolio estatal, PHOENIX – El Presidente del Caucus Latino de la Legislatura estatal, Rep. Martin Quezada, D-Phoenix (Distrito 29), emitió la siguiente declaración con respecto a la legislación de reforma migratoria integral presentada por un grupo de ocho Senadores del Congreso de los Estados Unidos. "Me alegra que un grupo bipartidista de senadores está tomando la iniciativa en la reforma migratoria integral a nivel federal. Es un tema emocional y complejo que afecta a todos los estados, sobre todo a Arizona. Es bueno que por fin tengamos un punto de partida para este importante debate. "Aunque algunas de las disposiciones son preocupantes, apoyo los esfuerzos para crear una reforma con sentido común. Ninguna propuesta de reforma al sistema de inmigración habría sido aceptable si no incluyera un camino razonable para la ciudadanía. Tenemos que encontrar una manera de proporcionar oportunidades justas de ciudadanía para los estudiantes, trabajadores inmigrantes y sus familias. El proyecto de ley permitirá que aproximadamente 11 millones de inmigrantes se les de la oportunidad de legalizar su situación con una nueva visa que creara un estado provisional para inmigrantes. "Todavía hay mucho por hacer, sin embargo esta iniciativa es una muestra de buena fe. Voy a seguir de cerca esta legislación, ya que afecta en gran medida a nuestro estado”. STATE CAPITOL, PHOENIX – Since a landslide damaged a portion of Highway 89 in February, Rep. Jamescita Peshlakai, D-Cameron (District 7), has advocated for emergency funding to repair the damaged highway and to create a detour by paving Navajo Route 20. STATE CAPITOL, PHOENIX – The efforts of Rep. Albert Hale, D-St. Michaels (District 7), to get Transaction Privilege Tax money back into the Native American lands where it was collected has moved a step closer to becoming law. “We are one step closer to providing American Indian communities with access to the TPT money collected on their lands,” Hale said. Hale explained that currently, TPT money, or sales tax, is collected from businesses not owned by enrolled members operating on Native American lands. The tax money is distributed to the state, counties and municipalities. Indian nations are not included in this distribution formula. Hale has worked diligently during the legislative session to correct this problem in the distribution formula. A joint conference committee recently adopted an amendment to SB 1283 that would put 25 percent of TPT money collected from businesses on Native American lands directly back to the Indian nations where it was collected. The bill as amended would allow the use of the Indian nations’ share of TPT money as collateral for bonds or for loans to finance telecommunications, infrastructure development, community projects and roads. SB 1283 would create a study committee to analyze possible county boundary changes and TPT distribution equity and requires the committee to publish a report of its findings by the end of the year. The conference committee amendment eliminates the county study commission and replaces it with distribution of TPT revenues to Indian nations and counties. This amended bill must still be passed by both the House of Representatives and the Senate before going on to the governor. STATE CAPITOL, PHOENIX – This week the Arizona Legislature’s Native American Caucus met to learn what challenges and opportunities face Native American youth who want to pursue a higher education. The group heard recommendations from experts who work with Native American students at Arizona’s public and private universities. The Arizona Legislature’s Native American Caucus meets biweekly at the Arizona State Capitol during the legislative session to discuss topics of importance to Tribal communities and their residents. Many members of the Arizona Legislature are involved in the Caucus. Some are Native American themselves but others, who are not Native, represent Tribal communities and so are especially concerned about issues of concern to Native American constituents. More specific information about what was discussed at the Caucus meeting, including presentations and other documents, is available upon request. STATE CAPITOL, PHOENIX – As the legislative session approaches the 100th day, many of the newest members are fed up with the lengths to which some of the ideologues at the Capitol will go to obstruct the efforts of Democrats to move Arizona forward. Rep. Stefanie Mach, D-Tucson (District 10), is one of several new Democrats serving in the House of Representatives for the first time. She said she was optimistic about the ability of the incoming members to set aside partisan bickering and to focus on the issues that matter most to the people of Arizona. Rep. Jamescita Peshlakai, D-Cameron (District 7), said she had a similar experience after proposing an idea to create a Native American Day, after the Arizona House of Representatives passed a bill to create a Cowboy Day. Peshlakai added that she has seen how extremists are obstructing attempts to expand Medicaid. Rep. Andrea Dalessandro, D-Sahuarita (District 2), said she is concerned with how out-of-touch some of the Republicans are with the people of Arizona. Dalessandro sponsored House Concurrent Memorial 2007, which asked Congress to take action to prevent the closing of the Cherrybell Mail Processing Center in Tucson. During her work to get support for HCM 2007, Dalessandro said she had to spend a lot of time encouraging people in the Senate to hear the memorial. Dalessandro added that she and many of the other freshmen are concerned that the extremists at the Legislature are so committed to an ideological agenda that they are ignoring the Arizonans who are represented by Democrats. What's going on behind closed doors? 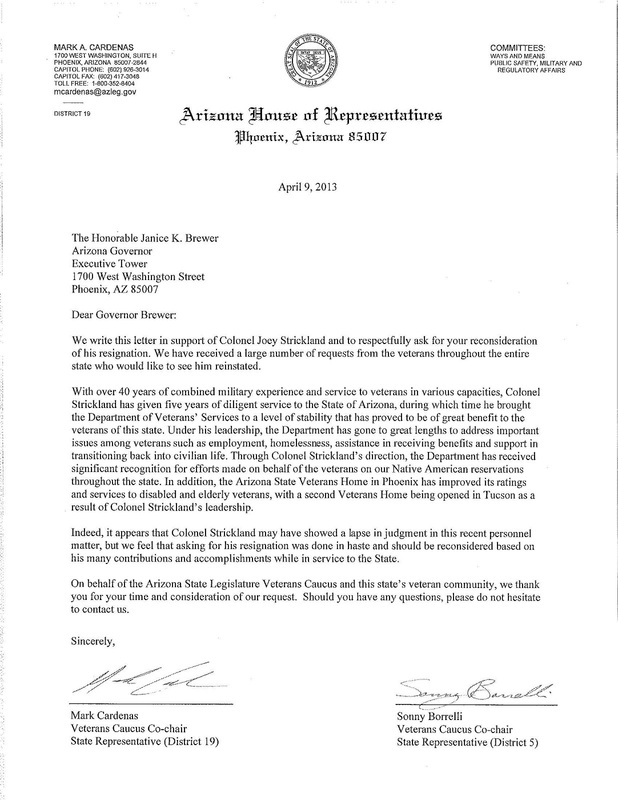 STATE CAPITOL, PHOENIX – Today Rep. Mark Cardenas, D-Phoenix (District 19), on behalf of the Arizona Veterans Caucus, called on Gov. Jan Brewer to reinstate Col. Joey Strickland. 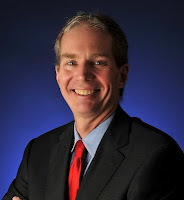 Strickland is the former director of the Arizona Department of Veterans’ Services who recently resigned. 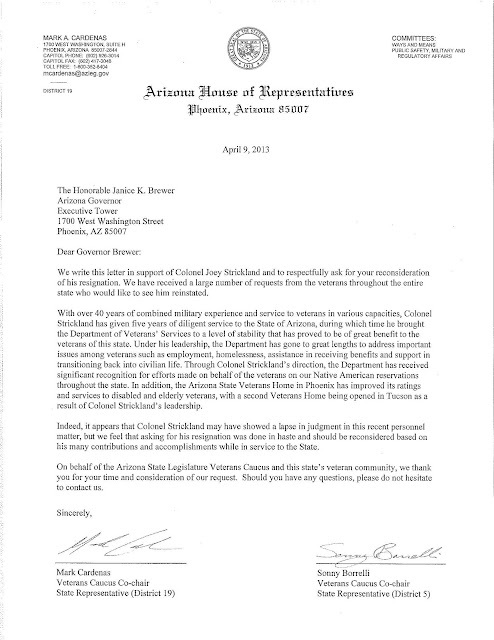 Cardenas and Rep. Sonny Borrelli, R-Lake Havasu (District 5), the co-chairmen of the Arizona Veterans Caucus, signed and delivered a letter to the governor advocating for Strickland’s reinstatement. PALA, Calif. – Arizona Rep. Albert Hale, D-St. Michaels (District 7), shared stunning statistics on youth drug use with a crowd of Native American leaders and community members at the annual Native American Youth Forum on April 5 at the Pala Casino and Resort in Pala, California. This gathering is the first of its kind asking Native American leaders to focus on drug abuse in Indian Country. Leading the group with his call to action, Hale announced that native youth have the highest percentage of illicit drug abuse, which leads to other crimes and dysfunction in the community. “I am deeply concerned about all the youth incarcerated in the federal system, 79 percent are Native American. This is unacceptable. We must act and do something to stop this now,” Hale said. “Our children deserve more. They are not a promise in a campaign; they are our priority. We must include them in the conversation and show them that we love them and hold ourselves accountable for their future,” Hale said. Hale addressed the challenges found in most Native lands such as high poverty, low employment, high dropout rates, and lack of infrastructure. “When our kids come home after school, what is there for them to do? We don’t have youth centers, we don’t have basketball courts, we don’t have libraries – we have little to offer them. So what do they turn to? They turn to drugs and gang activity. We know this. We are responsible to do something about it now,” Hale said. The Native Youth Forum featured additional guest speakers from Arizona including Bernadine Boyd Burnette, vice president, Fort McDowell Yavapai Nation; Mary Thomas, former governor of the Gila River Community; Dr. John Molina, Phoenix Indian Medical Center; and former Arizona State Attorney General Terry Goddard. All shared statistics and concerns about the youth they serve. The event was hosted by Loretta Avent, former deputy assistant to President Clinton for intergovernmental affairs, White House liaison to Indian Country and liaison to First Lady Hilary Rodham Clinton’s Office. Avent said she decided to collaborate with Millennium Laboratories, based in San Diego, to bring Native American Youth Drug Education for a Community Response to tribal leaders. STATE CAPITOL, PHOENIX –Rep. Andrea Dalessandro, D-Sahuarita (District 2), announced that her effort to keep the Cherrybell Mail Processing Center open earned overwhelming support in the Arizona Senate and will now go to the United States Congress. Dalessandro sponsored House Concurrent Memorial 2007, which asks Congress to take action against the closing of the Cherrybell Mail Processing Center in Tucson. A house concurrent memorial can be used by the State Legislature to make an official statement on an issue outside its jurisdiction. On Thursday, the Senate voted in favor of the memorial 27-2. STATE CAPITOL, PHOENIX – Today House Democrats railed against the Republican extremists at the Capitol who continue to focus on conspiracy theories instead of the priorities of Arizonans. Republicans, in an effort to appease Tea Party ideologues, amended a bill, HB 2573, to prevent the state from participating in a fictitious conspiracy involving the United Nations’ sustainability program, often referred to as Agenda 21. The amendment claims that the United Nations has enlisted the support of independent, nongovernmental organizations to implement its agenda. It prohibits local governments from working with any group attempting to overthrow the U.S. Constitution, with the express purpose of adopting Agenda 21. 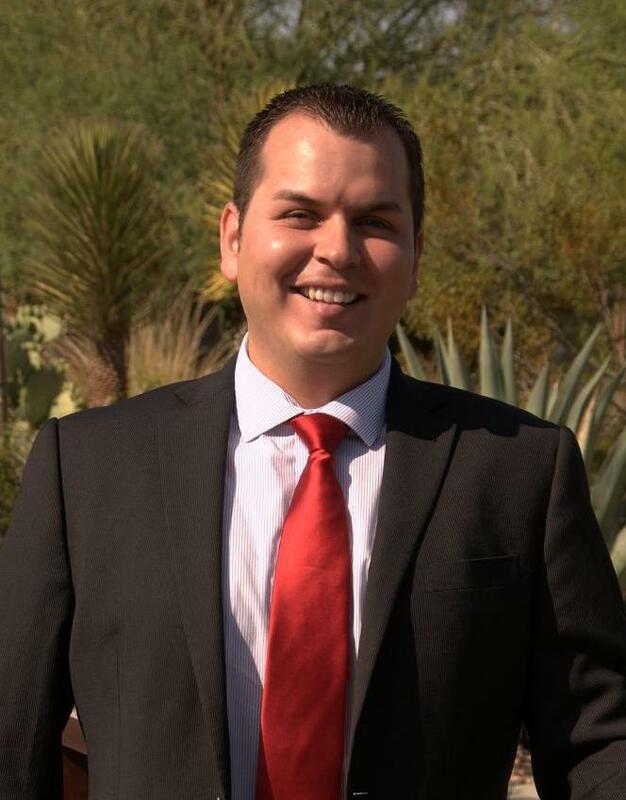 Rep. Mark Cardenas, D-Phoenix (District 19), added that Republicans also brought a bill to the floor that would allow people to use gold and silver, instead of money, in financial transactions in the state. House Democrats opposed both pieces of legislation. HB 2573 passed in the House, despite Democratic opposition and will now go to the Senate. The Committee of the Whole passed SB 1439 but this bill must be heard at least one more time in the House.